One of my problems in the winter is not getting enough vegetables. In the summer and fall I’m able to go to the farmer’s market and get fresh vegetables to cook with each week. When the winter comes I have to go to the market for my vegetables and while that is fine there isn’t a whole lot in season. I try to cook with vegetables that are in season but winter is hard. However, I’ve discovered that I love using seasonal vegetables in lasagna along with Certified Angus Beef®​ brand ground beef. I always use beef in my lasagna but adding plenty of seasonal vegetables adds nutrition and makes it even more filling. So what vegetables did I use in this lasagna? When looking around at the market I found butternut squash, leeks, and Brussels Sprouts to be in season. I bought all three and decided I’d figure out how to use them in a tasty lasagna when I got home. I started with the Certified Angus Beef®​ brand ground beef. I sauteed it in a pan and then added the butternut squash to it. 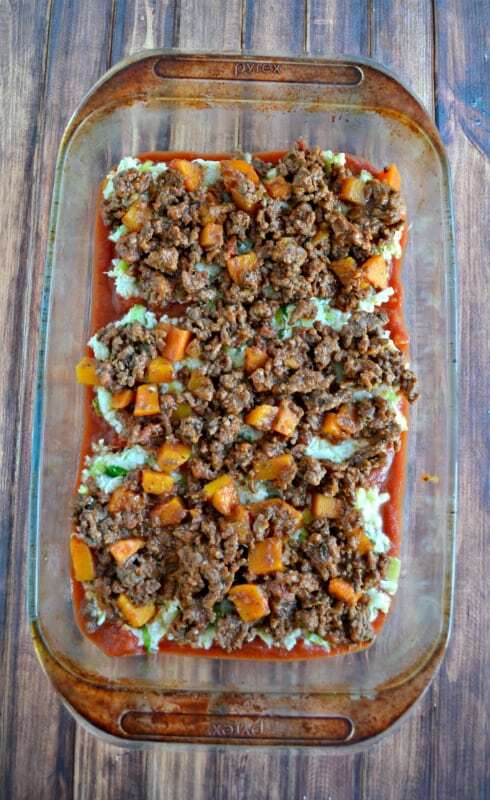 I thought the sweetness of the squash would taste great with the meaty ground beef. I then added some seasonings and sauce to the beef and squash mixture and set it aside. Next I sauteed the leeks and Brussels Sprouts along with some garlic and then I mixed it in with the ricotta cheese. I added in some mozzarella cheese as well. I took a taste of it and I loved the sauteed vegetables paired with the cheeses. Because I used vegetables in with the beef and cheese mixtures I only had two layers of lasagna instead of three and it totally filled up my pan. I was actually afraid it might boil over so I put a baking sheet underneath it. I didn’t have to worry though, it baked up perfectly. The resulting lasagna was delicious! We had it on a snowy night and it warmed us to the core. I thought that the combination of winter vegetables along with the Certified Angus Beef®​ brand ground beef was just about perfect. The lasagna was hearty, seasonal, and totally tasty. Plus we had plenty left over for the next day so I didn’t have to cook again! 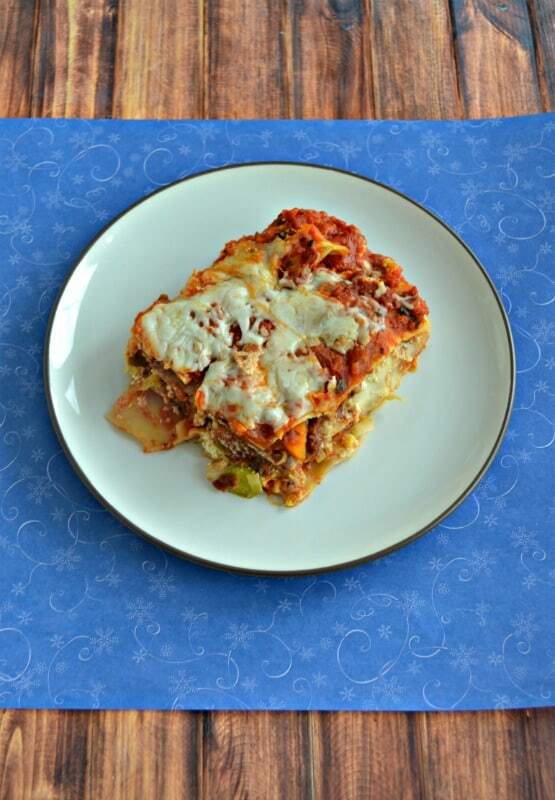 If you are looking to eat seasonal in the winter give this flavorful Beef and Winter Vegetable Lasagna a try! 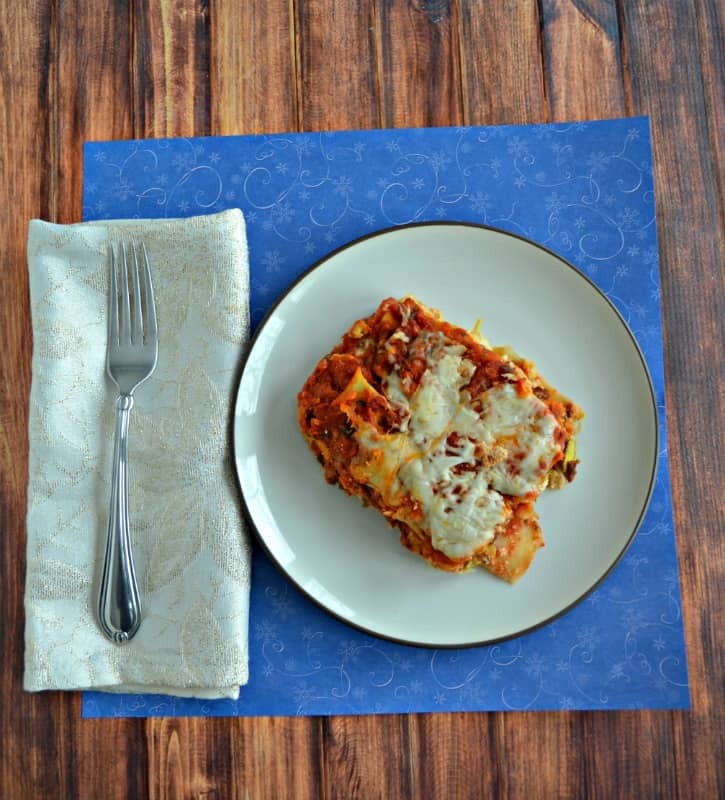 A delicious and seasonal lasagna made with Certified Angus Beef® brand ground beef and winter vegetables. Place the Certified Angus Beef® brand ground beef in a large skillet and saute for 5-7 minutes or until it begins to brown. 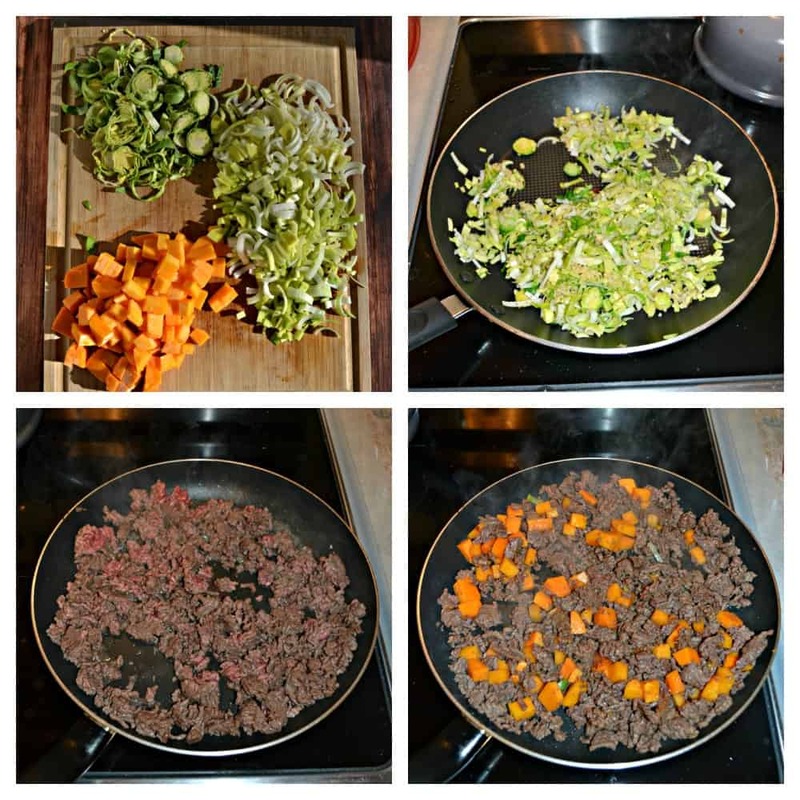 Add 1 tablespoon of olive oil to the pan with the ground beef in it and add in the butternut squash. Continue cooking for 5 minutes or until the squash begins to soften. 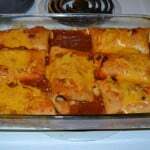 Remove from heat and add oregano, Italian seasoning, 1 teaspoon of salt, and 1 cup of marinara sauce. Mix well and set aside. In the same saute pan add the remaining olive oil over medium heat. Add in the leeks and Brussels Sprouts and cook for 5 minutes. Add in the garlic and cook an additional 1 minute. Remove from heat. In a medium bowl combine the leeks and Brussels Sprouts mixture, the ricotta cheese, the egg, and the black pepper. Mix well. Stir in one cup of mozzarella cheese. Place 1 cup of marinara sauce in the bottom of the baking dish. 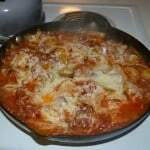 Place 3 lasagna noodles in the dish. 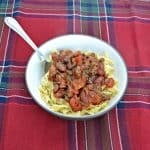 Spoon half of the ricotta mixture evenly on top of the noodles and then the ground beef mixture evenly on top of the ricotta cheese mixture. 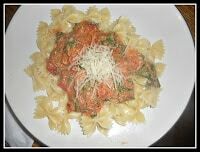 Sprinkle with 1 cup of mozzarella cheese and one cup of sauce. 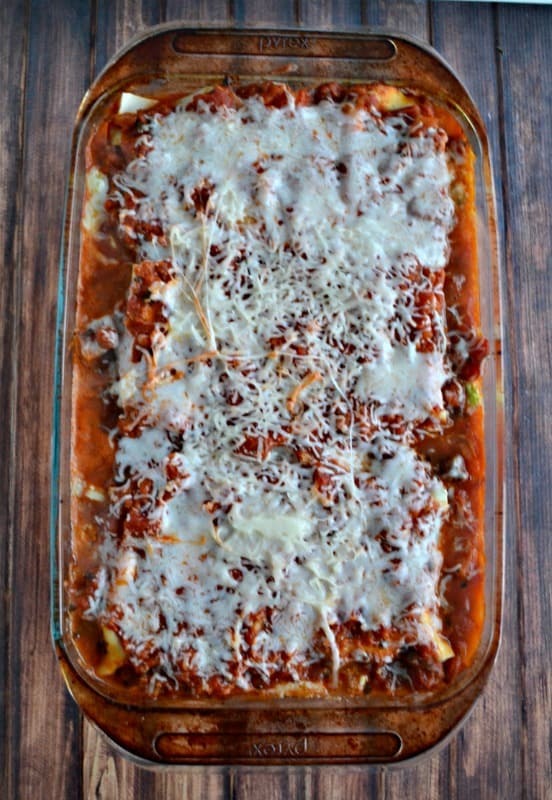 Place 3 lasagna noodles on top of the first layer and then repeat the layers of ricotta, ground beef, cheese, and sauce followed by 3 more lasagna noodles. Pour the remaining marinara sauce on top of the noodles. Sprinkle the remaining mozzarella on top. Cover the lasagna with foil and bake for 45 minutes. Remove the foil and bake an additional 10 minutes. Remove from oven and cool for 5 minutes before cutting. If you are looking for more delicious recipes using Certified Angus Beef®​ brand or just want to talk about beef make sure to join us in the Certified Angus Beef®​ Kitchen on Facebook! I have the same issue with finding veggies in the winter. 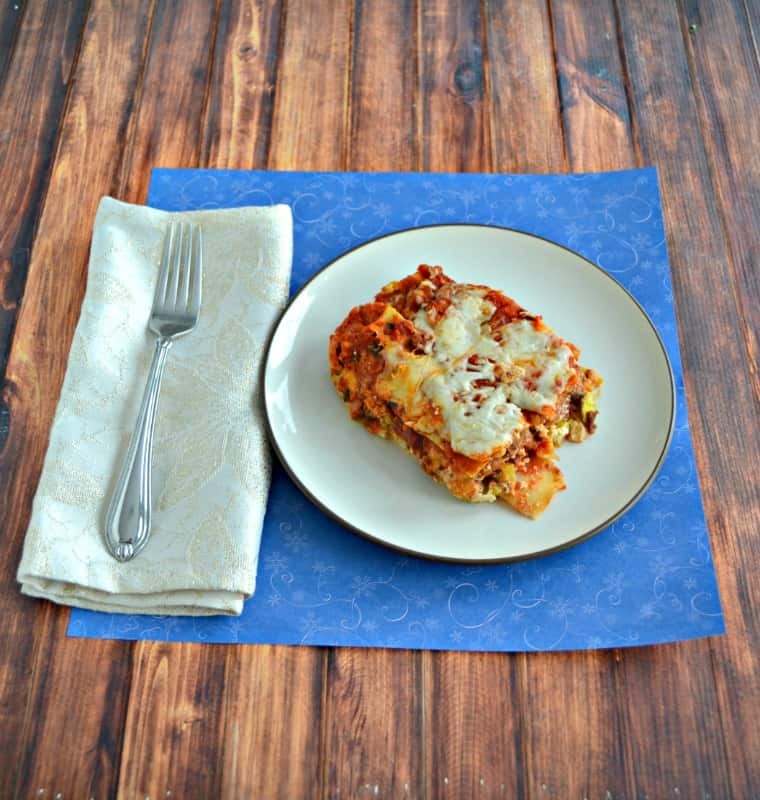 Such a great idea to add them to lasagna! Looks delicious, cant wait to try it!